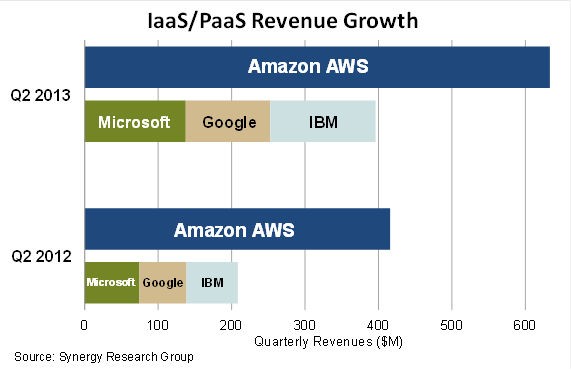 Another day brings another wisp of data highlighting the difference in revenue between Amazon Web Services and the other megaclouds. This time the data is courtesy of analyst firm the Synergy Research Group, which says that for the second quarter of 2013, global infrastructure-as-a-service and platform-as-a-service revenues accounted for some $2.25bn in revenue, with Amazon taking a whopping 28 percent of all market share. "Amazon is doing an impressive job of keeping its grip on market leadership and remains in a league of is own," Synergy Research Group analyst John Dinsdale said in a canned statement. "The real race is to see if any of the chasing pack can establish themselves as a clear number two in the IaaS/PaaS market. While IBM's acquisition of SoftLayer helped it to leapfrog both Microsoft and Google, the three remain tightly bunched with somewhat similar growth trajectories." Synergy's figures show that Amazon's closest competitors are Microsoft, Google, and IBM, and that these three companies all make much less than Bezos & Co, whose cloud is estimated to have turned over a shade more than $600m in the most recent quarter – lining up nicely with El Reg's cloud desk's own estimates. "Microsoft, Google and IBM are all chasing hard and are growing aggressively, but their aggregated revenues in the market still equate to only 63% of Amazon's," the Synergy report explains. The research appears to contradict public statements made by Microsoft about the size of its Azure business. The company had said in April that Azure was a billion-dollar business – though this figure did include "software provided to partners to create related Windows cloud services." Despite multiple requests for clarification since then, Microsoft has so far not given us further information on what composes this figure. "Companies often make statements like 'x is a billion dollar business' and those statements are usually marketing smoke-and-mirrors designed to make a business look as big as possible," Dinsdale told The Register. "Typically such statements are not tied to tight definitions (and can therefore include a whole basket of associated products and services) and may refer to metrics other than booked revenues – such as size of outstanding order book, order intake over a period of time, or revenue run rates. Unless we can justify statements of this nature, we will rarely take them at face value." Synergy's data comes from a combination of publicly available data, off the record discussions, and quarterly surveys sent to 60 leading service providers, including Google, IBM, Amazon, Engine Yard, Fujitsu, Microsoft, Rackspace, and others. The report comes after the release of Gartner's recent infrastructure-as-a-service Magic Quadrant, which found that Amazon was far and away the most advanced cloud in terms of capability, and also revenue. Gartner estimated that Amazon had "more than five times the compute capacity in use than the aggregate total of the other fourteen providers in this Magic Quadrant."